Sally E. Bahner has been a writer and editor for 40 years. Her office assistants are Tekla, a Russian Blue, and Mollie, a black and white domestic shorthair. A longtime local journalist, Sally has spent the last 20 years specializing in cat-related issues, specifically nutrition, holistic care and multiple cat behaviors. She has been a columnist for several newspapers along the Connecticut shoreline since 1997. Sally was editor-in-chief of The Whole Cat Journal and has contributed to CatNip, Cat Watch, and Animal Wellness. More recently, she has developed a practice as a feline behavior and care consultant. Bahner is a supporting member of the International Association of Animal Behavior Consultants and a member of the Society of Professional Journalists and the Cat Writers’ Association. She has received multiple awards through CWA and Connecticut Chapter Society of Professional Journalists competitions. She has been a guest on Tracie Hotchner’s Dog Talk and Cat Chat and has appeared on local television. 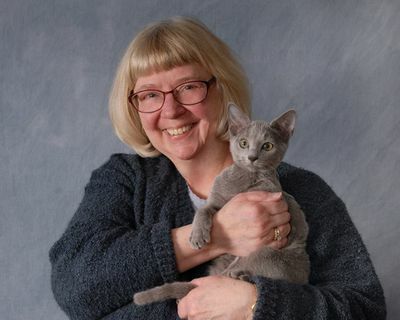 Sally has taught courses on cat care and has presented programs throughout the New Haven, Connecticut area.